Non-hazardous, yet powerful cleaner designed to remove the toughest soils from concrete. 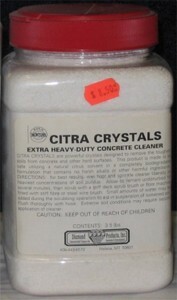 Citrus based crystalline formula. Easy to use, sprinkle on, wet, scrub with a brush, let stand, scrub, and flush off.